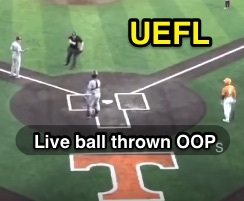 Seeking to exchange baseballs, a pitcher in Tennessee threw a ball into the dugout and out of play without first requesting "Time" from the umpire. This was a live ball and because runners were on second and third base at the time, the offense was awarded two runs as a result of the play, the squad's only two runs of a ballgame that the team won, 2-1. Umpire awards two bases on ball thrown away. The Play: With none out and two on (R1, R2), the batter from Tennessee bunts to the pitcher from Mississippi State, who throws to first base to complete the sacrifice. After getting the ball back from his first baseman, the pitcher then bounces the ball into the dugout, as fielders often do when they seek a replacement ball from the umpire while time is out. The only problem here is that time was not out, and the umpire treated the ball thrown out of play as—well, exactly what the rule prescribes for a ball thrown out of play—and awarded the two baserunners two bases from their positions at the time of the throw, effectively scoring two runs for Tennessee in what would turn out to be a 2-1 victory. A similar play also occurred in 2017. A similar play occurred during a July 2017 American Association game when Texas AirHogs pitcher Luis De La Cruz threw a baseball out of play without requesting "Time" and while the ball was still live. In that situation, the pitcher had walked the bases loaded and, after receiving the ball from his catcher in the wake of issuing the walk, threw the baseball in the dugout while the ball was still live. As a result of this live ball thrown out of play, R1 and R2 scored while the batter-runner was placed at third base. 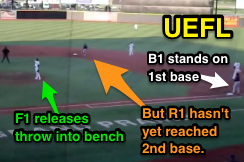 AirHogs Manager Billy Martin, Jr. was ejected by HP Umpire Kurt Branin for arguing this ruling. Click the link for a full article on the issue. Related Post: Case Play 2017-7 - When Base Awards Overlap [Solved] (7/6/17). OBR Rule: In professional baseball, the rule is 5.06(b)(4)(G), which states, "Each runner including the batter-runner may, without liability to be put out, advance—Two bases when, with no spectators on the playing field, a thrown ball goes into the stands, or into a bench (whether or not the ball rebounds into the field), or over or under or through a field fence, or on a slanting part of the screen above the backstop, or remains in the meshes of a wire screen protecting spectators. The ball is dead." NCAA Rule: In college, the rule is 8-3.o.3, which entitles runners to two bases, "If a live thrown ball goes into the stands or dead-ball area, spectators or a players’ bench, lodges in the equipment of an umpire, or sticks in the fence, shrubbery, etc., and provided it is not thrown by a pitcher from the pitching rubber, the ball is dead." lodges in a fence and it is not thrown by a pitcher from his plate as in 8-3-3d." The key is the difference between live and dead ball. Remember, a ball remains live unless it becomes dead by rule, or by an umpire's call of "Time," which only can be made under certain circumstances. In general, umpires keep play alive after a base hit, out, or other event when the ball remains on the field and if a fielder wishes to exchange a baseball, that fielder must first ask for and be granted "Time" before throwing the ball out of play, lest the live ball, two-base award apply. Within all of that, somewhere, is OBR's General Instructions to Umpires, with this relevant sentence: "Keep your eye everlastingly on the ball while it is in play." That's what the umpires did here and that's what enabled them to get this call correct.